Bringing Science to the Cannabis Conversation! 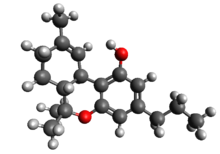 Tetrahydrocannabivarin (THCV, THV) is a homologue of tetrahydrocannabinol (THC) having a propyl (3-carbon) side chain instead of a pentyl (5-carbon) group on the molecule, which makes it produce very different effects from THC. Similar to THC, THCV has 7 double bond isomers and 30 stereoisomers (see: Tetrahydrocannabinol#Isomerism). Plants with elevated levels of propyl cannabinoids (including THCV) have been found in populations of Cannabis sativa L. ssp. indica (= Cannabis indica Lam.) from China, India, Nepal, Thailand, Afghanistan, and Pakistan, as well as southern and western Africa. THCV levels up to 53.7% of total cannabinoids have been reported. THCV is a cannabinoid receptor type 1 antagonist and cannabinoid receptor type 2 partial agonist. Δ8-THCV has also been shown to be a CB1 antagonist. Both papers describing the antagonistic properties of THCV were demonstrated in murine models. Unlike THC, cannabidiol (CBD), and cannabichromene (CBC), THCV doesn’t begin as cannabigerolic acid (CBGA). Instead of combining with olivetolic acid to create CBGA, geranyl pyrophosphate joins with divarinolic acid, which has two fewer carbon atoms. The result is cannabigerovarin acid (CBGVA). Once CBGVA is created, the process continues exactly the same as it would for THC. CBGVA is broken down to tetrahydrocannabivarin carboxylic acid (THCVA) by the enzyme THCV synthase. At that point, THCVA can be decarboxylated with heat or UV light to create THCV. THCV is a new potential treatment against obesity-associated glucose intolerance with pharmacology different from that of CB1 inverse agonists/antagonists. GW Pharmaceuticals is studying plant-derived tetrahydrocannabivarin (as GWP42004) for type 2 diabetes in addition to metformin. It is not scheduled by Convention on Psychotropic Substances. In the United States, THCV is not specifically listed as a Schedule I drug, but “Marijuana Extract” is. THCV could be considered an analog of THC, in which case, sales or possession intended for human consumption could be prosecuted under the Federal Analog Act. THCV is not scheduled at the federal level in the United States. ^ Turner, Carlton E; Hadley, Kathy; Fetterman, Patricia S (1973). “Constituents of Cannabis sativa L. VI: Propyl Homologs in Samples of Known Geographical Origin”. Journal of Pharmaceutical Sciences. 62 (10): 1739–41. doi:10.1002/jps.2600621045. PMID 4752132. ^ Hillig, K. W; Mahlberg, P. G (2004). “A chemotaxonomic analysis of cannabinoid variation in Cannabis (Cannabaceae)”. American Journal of Botany. 91 (6): 966–75. doi:10.3732/ajb.91.6.966. PMID 21653452. ^ Pertwee, Roger G (September 2007). “The diverse CB1 and CB2 receptor pharmacology of three plant cannabinoids: Δ9-tetrahydrocannabinol, cannabidiol and Δ9-tetrahydrocannabivarin”. British Journal of Pharmacology. 153 (2): 199–215. doi:10.1038/sj.bjp.0707617. PMC 2219532. PMID 17828291. ^ Pertwee, R G; Thomas, A; Stevenson, L A; Ross, R A; Varvel, S A; Lichtman, A H; Martin, B R; Razdan, R K (2009). “The psychoactive plant cannabinoid, Δ9-tetrahydrocannabinol, is antagonized by Δ8- and Δ9-tetrahydrocannabivarin in mice in vivo”. British Journal of Pharmacology. 150 (5): 586–94. doi:10.1038/sj.bjp.0707124. PMC 2189766. PMID 17245367. ^ Wargent, E T; Zaibi, M S; Silvestri, C; Hislop, D C; Stocker, C J; Stott, C G; Guy, G W; Duncan, M; Di Marzo, V; Cawthorne, M A (2013). “The cannabinoid Δ9-tetrahydrocannabivarin (THCV) ameliorates insulin sensitivity in two mouse models of obesity”. Nutrition & Diabetes. 3 (5): e68. doi:10.1038/nutd.2013.9. PMC 3671751. PMID 23712280. ^ “GW Pharmaceuticals Provides Update on Cannabinoid Pipeline” (Press release). GW Pharmaceuticals. Retrieved 2015-09-19. What is the Difference Between Hemp and Cannabis?